Will Allen, founder, Chief Executive Officer, and a 2008 MacArthur Prize Winner, believes, “If people can grow safe, healthy, affordable food, if they have access to land and clean water, this is transformative on every level in a community. I believe we cannot have healthy communities without a healthy food system.” Growing Power transforms communities by supporting people from diverse backgrounds and the environments in which they live through the development of Community Food Systems. These systems provide high-quality, safe, healthy, affordable food for all residents in the community. Growing Power develops Community Food Centers, as a key component of Community Food Systems, through training, active demonstration, outreach, and technical assistance. The goals of Growing Power are: to grow food, to grow minds, and to grow community. The Friends of the Library and the Avery Research Center will welcome Dr. Myers in a discussion of her recent publication, Forging Freedom: Black Women and the Pursuit of Liberty in Antebellum Charleston, which analyzes how black women in Charleston acquired, defined, and defended their own vision of freedom. Discussing topics such as manumission, work and property ownership, Myers argues that for black women in the Old South, freedom was an experience, not just a fixed legal category. Emancipation without the ability to improve one’s financial, social, and legal standing was a poor imitation of liberty. Ultimately, Forging Freedom reveals the ways in which Charleston’s black women overcame significant obstacles in order to craft a freedom of their own design instead of settling for the limited liberties imagined for them by white Southerners. 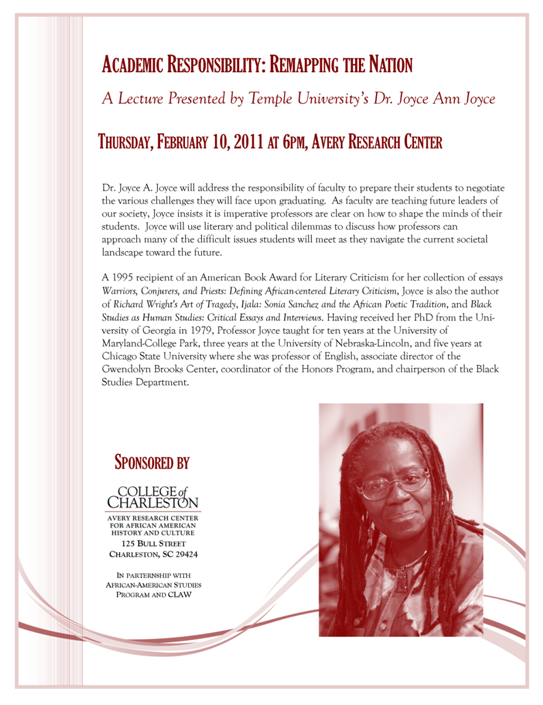 A lecture presented by Temple University’s Dr. Joyce Ann Joyce on Thursday, February 10th at 6pm at the Avery Research Center.